Dave Kelbie is a perfect example of why Dupont guitars are so popular and worth every penny of their price. He has had a MD50 for almost two decades and, despite his busy schedule, it has needed minimal maintenance and is now worth more than he paid for it. A self taught guitarist, Dave Kelbie’s first professional engagements were with the celebrated Gypsy guitarist from Holland Fapy Lafertin. He initiated the first European tour in 1989 with the quartet Lejazz and this partnership has lasted until recently with CD releases on Lejazzetal Records including "Swing Guitars" and the highly acclaimed "Hungaria" with tours as recent as 2004. Through his alliance with Lafertin have come performances with musicians such as Hungarian violinist Roby Lakatos, USA Clarinettist Bob Wilber, Bireli Lagrene and Lollo Meier. Over the last 20 years Dave has been a prominent accompanist to many of the world’s leading Jazz soloists and Gypsy musicians. He has developed an extended professional role as a tour promoter and a record producer. Lejazzetal, set up by Kelbie in 1989, has won international recognition for initiating and promoting the highest quality jazz and European Gypsy music projects on tour worldwide. At the core of the company’s work is a strong emphasis on Gypsy culture through which has come partnerships with many of Europe’s most gifted Roma musicians. Lejazzetal has created a platform for many previously unknown Gypsy groups with a role as a catalyst for the further career development. Kelbie continues to work in his own quartet with the great Angelo Debarre, the lyrical Dutch guitarist Lollo Meier, and UK legend John Etheridge. With his last project though, Evan Christopher’s Django a la Creole, Kelbie has become one of the most sought after rhythm guitarists on the worldwide stage. Mario Carrillo is a versatile upright and electric bass player. He started studying music at a young age and continued his classical studies to perform extensively in Spain and internationally with renowned orchestras like the Madrid Youth Symphonic Orchestra(JORCAM) and the Symphonic Orchestra of Chamartin (OSC) in countries like Italy, France, Czech Republic, Slovakia, and Austria. At age 18, he was first introduced to Jazz and modern music when he entered the prestigious Escuela de Música Creativa (EMC) in Madrid. During this time, he co-founded Jazzlibitum (with Gabriel Casanova), a thrilling group combining jazz harmonies with funky grooves and electronics. He was also the house bass player for the EMC’s Jams Sessions that gathered the finest musicians in the Madrid music scene. He is currently touring India using the Volante Bass from Maurice Dupont Range. We would like to wish him and the Volante all the best as he continues his tour! We are very pleased to report that our good friend and excellent bassist David Swift (pictured left) recently took a Volante collapsible Double Bass out on the latest Jools Holland Orchestra world tour. The punishing 25 day schedule started in Amsterdam and finished in Buenos Aires with the guys, and the bass, travelling some 35,000 miles and playing many of the finest venues in the world including the famous Blue Note in Japan. 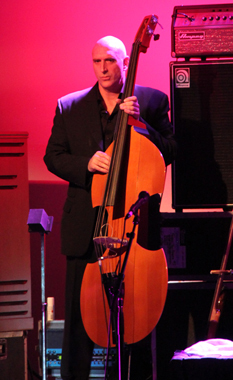 “I’ve had an ongoing fascination with the electric upright bass (eub) from when I first started playing. I loved how seemingly futuristic they all looked, and I relished how easy they were to transport. Over the years I have played and tried countless eub’s, and owned a considerable number of them too. Many eub’s currently available are simply not very good. The conceptions and designs are lazy, inferior materials prevail, very few are aesthetically pleasing, and the majority I’ve tried just don’t feel or sound good at all. The thing is, they are fairly inexpensive and for someone who has only played bass guitar and wishes to move into upright territory without breaking the bank, these cheaper models are a viable stepping stone. Although I’ve used some well known brands of eub’s over the years, I’ve never been completely satisfied. The majority of commercially available eub’s sound like oversized fretless bass guitars. I have always wanted an instrument that feels, plays, and sounds as close to an amplified Double Bass as possible, and I was beginning to think that I would never find my dream bass…….. until now….. Step forward French luthier Maurice Dupont and the Volante foldable travel bass. The Volante does everything I’ve always wanted from this type of instrument, and as an added bonus, from the front, it even looks like a traditional Double Bass. This is without question the best electric upright bass I have ever played. The design is intelligent and inspired. It feels, plays, and sounds as good as any amplified Double Bass I’ve played. The genius of the Volante is that the front is designed to function exactly as an acoustic bass would. It even has its own bass bar and sound post. I also have to play at high volumes onstage with the Jools Holland band and have no problems with feedback whatsoever using this bass. For the touring musician it dismantles and fits into a golf bag sized flightcase. This was perfect for me on the recent tour. In my opinion, no other eub comes close to the quality, playability and sound of the Volante bass. I wish I had discovered it sooner, but now I have, I will be retiring all my other eub’s. This bass is amazing, and like the Fender bass, the Volante should be the eub industry standard. "Sandarac's consultation process, combined with the natural quality of their materials, results in basses with an even, deep tone with lots of sustain. And without the wolf notes normally associated playing beyond 6th position these basses are a pleasure to practise on and immediately opened my own playing to a wider range of tonal possibilities"
A Bulgarian hand crafted string bass made to order and customised in the UK to the player's specific needs. Sounds good? It is and you won't have to take out a second mortgage. Made out of locally sourced tone woods kiln dried in the traditional manner, this very pretty instrument comes in three quarter size as well as full size with a variety of finishes. It has a warm 'woody' but lively timbre particularly in the lower register and is well balanced across the full range with excellent sustain and harmonic response. Playing is a pleasure, the neck is neither too deep nor too wide and there aren't any rough edges underneath the fingerboard. Indeed, the craftsmanship of this bass is remarkable with beautifully carved swell back, ebony detailing to the heel of the neck and a nicely fluted ebony tailpiece. Topped by German-made individual machine heads, French bridge, and tailed by a very solid brass threaded rubber foot, this bass has both character and class.